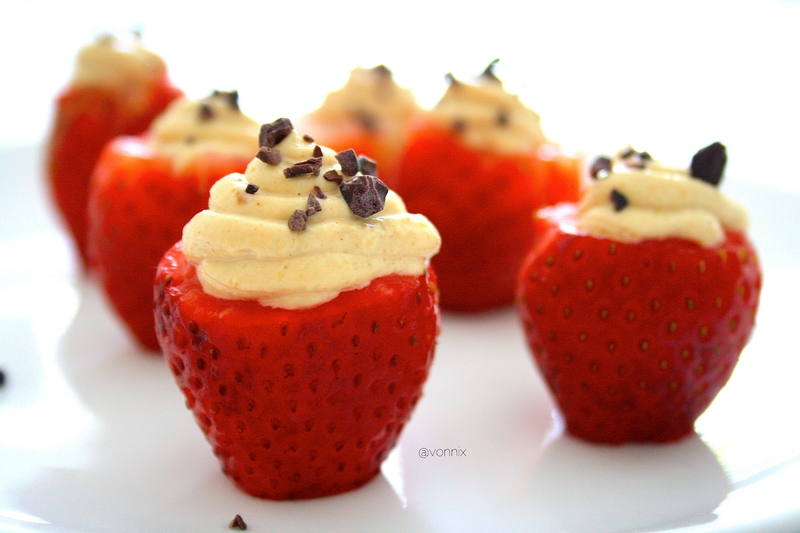 This is a high protein, low fat and low carb take on your regular stuffed strawberries loaded with cream and sugar. Rinse and dry strawberries. Cut off the leaves at the top and enough of the tip so that the strawberries are able to stand on their own. Using a dessert spoon, hollow out the top of each strawberry and set aside. In a small bowl, mix peanut flour, yogurt, salt and sweetener until well combined. Place filling into a small zip lock bag, gather it to one corner and cut off the tip. Carefully pipe into the tops of each strawberry. Sprinkle with cacao nibs and serve immediately.